It's time to celebrate! 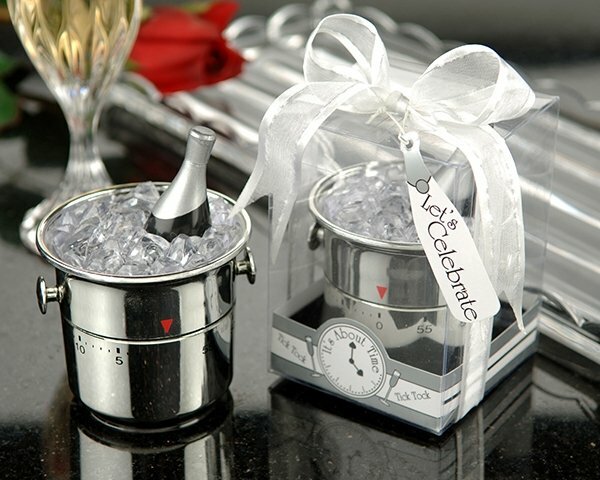 Our clever and classy little favor adds polished silver-toned touches to your reception table. 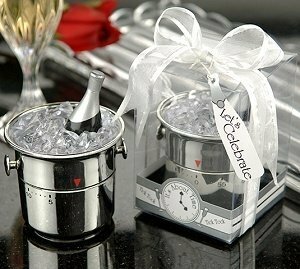 Glassy miniature "ice cubes" surround a bottle of the champagne which is nestled in a silver finish bucket, complete with little handles. The bottom of the bucket actually twists, to countdown any interval of time from one to sixty minutes. The box features an? "It's About Time"?clock graphic and tiny champagne flutes. It arrives ready to celebrate in a clear showcase box,?complete with sheer organza ribbon and bottle shaped gift tag that reads "Let's Celebrate!" Favors measure 3.75" x 2.75".